GBA Tekken Advance (USA) in 01:40.86 by AKheon. 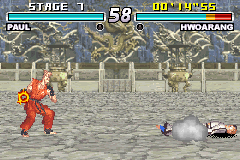 Tekken Advance is a fighting game in the Tekken series. While it is not considered canon to the Tekken storyline, it follows the events of Tekken 3 and includes most of the characters. It also features new stun mechanics. This run, done using the hardest difficulty and one round per opponent, uses careful luck manipulation and Paul's powerful Burning Fist to take out everyone as fast as possible. Input is ended early to show the founder of the King of Iron Fist tournament unable to hit an opponent who isn't even fighting back. For more Tekken runs that aim for fastest time, see the Tekken 2 or Tekken 3 runs for the PlayStation.